Recently my wife and I had lunch at the Sprecher Restaurant in Lake Geneva, WI. If you are ever in the area it is certainly worth the stop. The food is excellent and they serve an excellent variety of craft beers. After lunch we pursued our hobby of visiting the local antique stores (or rummage sales since we are not all that picky). There is what I would call a high-end antique store in Lake Geneva that features some of the finest antique furniture around. Usually, an antique store like that does not profit from us for a host of reasons but sometimes I find something small that fits into one of my niche hobbies-in this case, a pre-World War One postcard. The postcard is not addressed and there isn’t any message on the back. It asks for a one-cent stamp and was made in Germany and that’s about all the useful information that was on the back. It reads in the lower right Photo only Copyright 1907 De Witt C. Wheeler. My find is apparently from the illustrated song series. In our post-modern culture it seems corny or dated or both to think of love, romance and family life in such a traditional way. In the case above De Witt links the above themes with pre-World War patriotism. The subject matter features a unit of U.S. Cavalry headed in one direction and a column of U.S. Infantry in the back ground headed in another. The cavalrymen appear to be looking at the couple and in the direction of the camera while the doughboys (slang for WWI American Infantry) are oblivious to the posed drama being played out. The date on the card is 1907 or ten years prior to the US entry into World War One, The soldiers wear the distinctive campaign hat that was a feature of the American Army well into World War 2. When I was in the Army in the early seventies our drill instructors still wore them and for all I know still do. 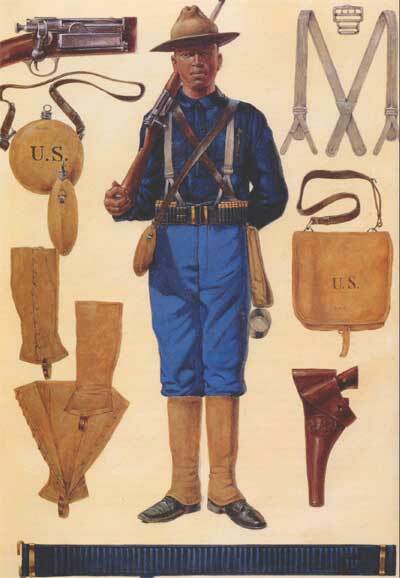 US Soldiers in the Spanish-American War fought in the blue uniforms as illustrated by this print from Brassey’s. The uniform of American soldiers in the Spanish-American War of 1898. It was however a period of transition between the traditional blue and khaki. 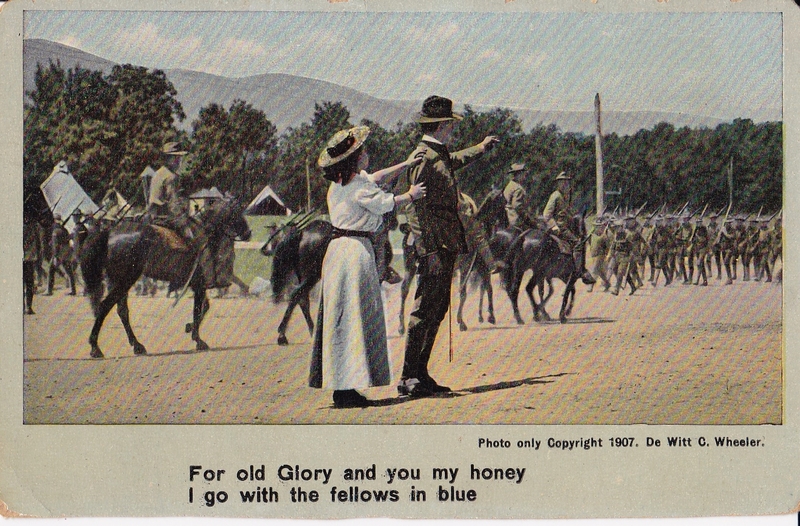 It is possible that De Witt colorized the blue from the Spanish-American War to the post-war khaki. For three bucks the card is a nice addition to my small collection of cards.